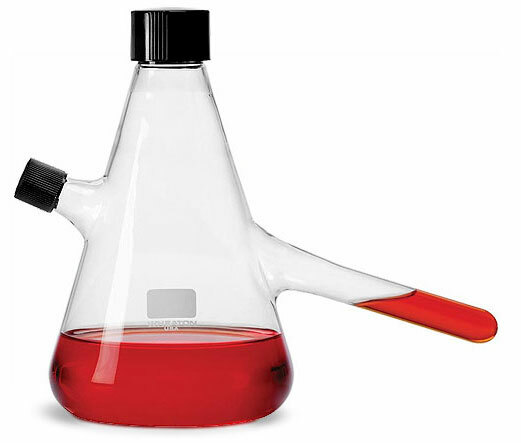 These clear glass nephelo culture flasks are made of low extractable clear borosilicate glass, and can be used in conjunction with colorimeters and spectrophotometer. The glass flasks allow growth and turbidity readings at selected intervals without sampling. When tilted, the flask's sidearm can be filled, and the sidearm inserted into a colorimeter or spectrophotometer to obtain readings. The glass sidearm is free of scratches and striations. 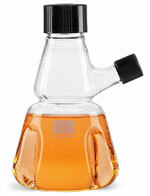 These glass flasks are designed for use on platform shakers and hold approximately 350 mL to the base of the sidearm. Contents of flask cannot enter the sidearm when on the shaker. The break- resistant lip can accommodate a cotton plug or stopper. 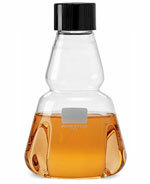 These glass nephelo culture flasks conform to USP Type I and ASTM E-438 Type I, Class A requirements.